I was intrigued. I used to own a fisheye lens many years ago, and remember that it was fun to play around with. Not many scenes work well with a fisheye lens, but some are custom made for a fisheye. So I purchased the Rokinon 8mm f/3.5 HD Fisheye Lens with Removable Hood for about $300. It's available for almost any DSLR mount. It is a manual-focus lens, but that's not an issue, since at a focal length of 8mm, you can just leave it focused at 1.5 feet and at f8, the depth of field will be from about 9 inches to infinity! The angle of view is pretty amazing. At times, it's difficult keeping you, the shooter, out of the image! You can see my body from my chest down along with my arms in the image below. They advertise it as being usefull with APS-C sized sensor cameras (Nikon DX format) or full-frame. But, unless you want a circular image, or plan on cropping, it really doesn't work with full-frame very well. Here's a full-frame un-cropped image taken on a Nikon D600. You can obviously crop the image to get a rectangular image, or, with a Nikon full-frame DSLR, can set the camera to DX image size. The remaining images were taken with the camera set to "DX" mode - which would be the same as any APS-C camera (Digital Rebel, Nikon D5100, etc.) and were also cropped a bit. 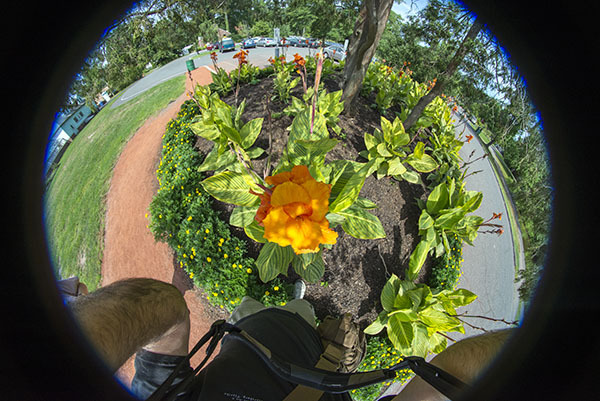 The extreme 180 degree angle of view offered by this lens allows for some unusual perspectives. It focuses as close as 1 foot - which sounds close, but, for a lens that's this wide, it isn't all that close. Even at a foot away, you'll be getting a LOT of the surrounding scenery. 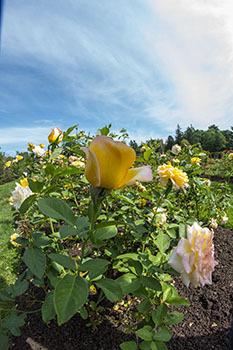 Here's a shot where I was actually less than a foot away from the yellow rose - you can see how much the lens captured. 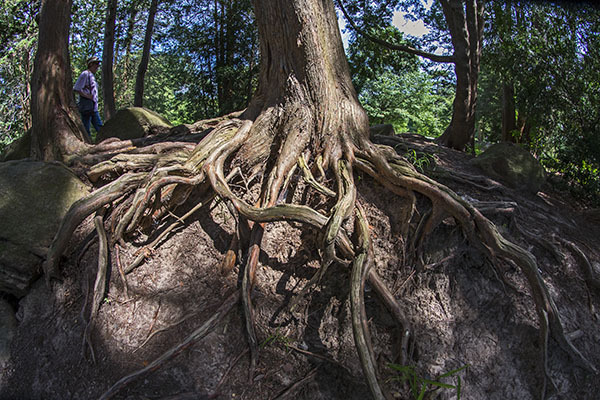 At a park nearby my home, I've always been intrigued by a particular tree's roots. The fisheye was an appropriate lens for this subject. 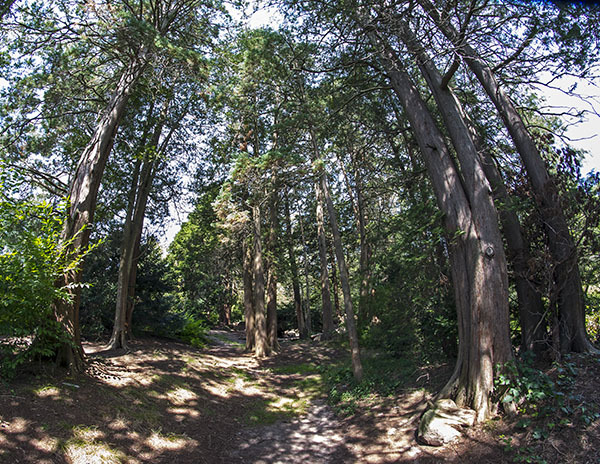 This lens has a lot of distortion, but, after all, it's a fisheye! The worst aberration I found was the chromatic aberration. In the center of images it's fine, but on the edges, it can be quite bad. 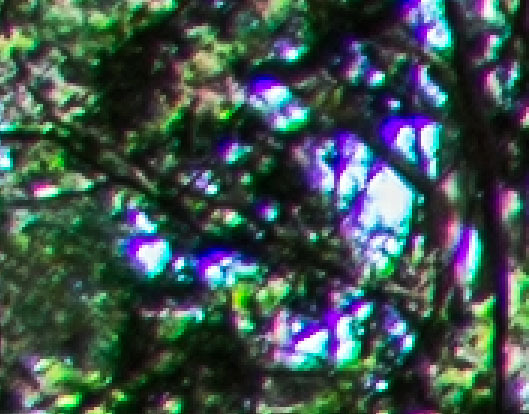 Here's an overly-enlarged (more than 100%) section of the corner of one image (the image above of the tree roots). You can see the purple-fringing is quite severe. But, in most images, slightly cropped, it won't be noticeable - and it's only bad in the extreme corners. If you're looking for a "Pro" lens - this isn't for you. The plastic mount is a bit cheesey. It's also a manual focus lens, but the depth of field is SO great, you almost don't ever need to focus - just set the focus to about 1.5 feet and set your aperture to f8. But, since the equivalent 10.5mm Nikon lens is more than twice the price, and the Canon 8-15mm fisheye is almost 4.5 times the price, for the times you'll be using it, it's a fun lens to have.